This case report highlights the importance of timely diagnosis of disseminated fungal infections in neonates, as well as the increased incidence of infection with non-albicans Candida, and the association with surgical conditions such as necrotising enterocolitis. A preterm male infant of 27 weeks' gestation was born to a 23-year-old gravida 2, para 1, HIV-negative mother via spontaneous vaginal delivery. Two weeks prior to the delivery, the mother had been admitted for acute pyelonephritis and treated with intravenous antibiotics. The infant weighed 1 kg, considered appropriate for gestational age (AGA) and had low Apgar scores. He was intubated, ventilated and started on surfactant, penicillin G and amikacin. On day 6 post delivery, he developed necrotising enterocolitis (NEC), grade III. A bowel resection was performed and meronem was added. Histology on the bowel resection showed features consistent with NEC. Postoperative sonar examination of the brain revealed an intraventricular haemorrhage, and examination of the heart revealed a patent ductus arteriosus of 3.1 mm. The C-reactive protein and white-cell counts were only marginally raised. A ß-D-glucan assay was not done. The infant died on day 14 post delivery, and a postmortem was requested. External examination of the body showed a male infant, with petechial haemorrhages on the upper extremities and chest. A fresh surgical scar, measuring 4 cm in length, was noted in the right hypochondrium. Weight, crown-rump length, crown-heel length, foot length and head circumference were AGA. Macroscopic evaluation of the organs showed congestion of both lungs and the liver. The brain appeared markedly autolytic. 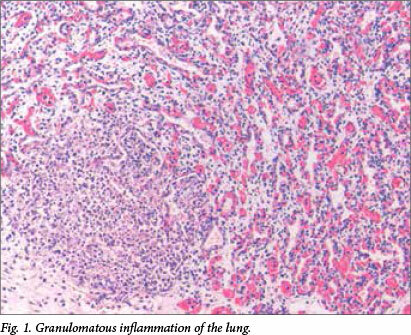 Microscopic examination revealed multiple well-formed granulomas in both lungs (Fig. 1), kidneys, the liver (Fig. 2), brain (Fig. 3) and right adrenal gland. 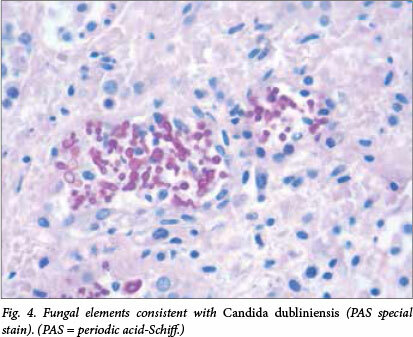 Fungal elements consistent with Candida spp. 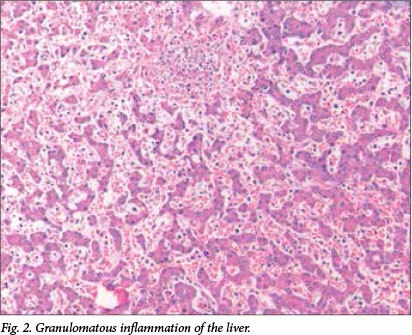 were seen within these granulomas. The periodic acid-Schiff special stain highlighted the fungal organisms (Fig. 4). 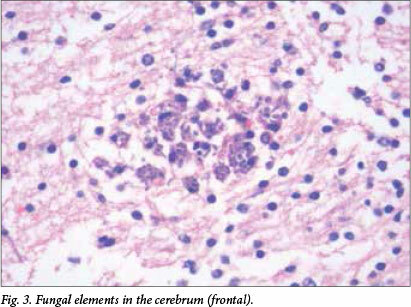 Examination of the autolytic tissue from the brain showed an extensive fungal meningoencephalitis (Fig. 3). Examination ofthe thymus revealed parenchymal haemorrhages seen in the first 12 hours following a stressful event. Marked sinusoidal congestion was present in the spleen. A blood culture was obtained from the infant 2 days prior to his death and the culture was positive for the species Candida dubliniensis. 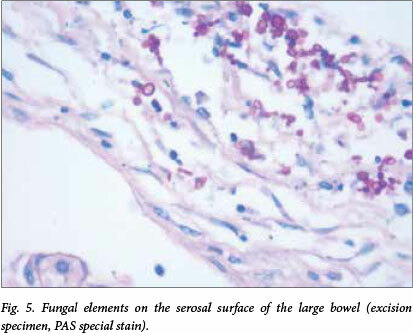 Review of the histology of the large bowel resection specimen revealed the presence of fungal elements similar to those seen on postmortem examination (Fig. 5). This was not reported at the time of the initial excision. Fig. 5. Fungal elements on the serosal surface of the large bowel (excision specimen, PAS special stain). This case shows an unusual pathogen as cause of sepsis in a preterm infant. The importance of early detection, not only for the clinician but also for the histopathologist, is highlighted in this case report. A steady decline in the incidence of neonatal fungal blood stream infections has been reported in the USA and Kuwait. [1-3] This is in contrast to a recent study at the Charlotte Maxeke Johannesburg Academic Hospital (CMJAH) neonatal unit, as published by Ballot et al., which showed an increase in neonatal fungal infections between 2007 and 2011. It is often difficult to confirm the diagnosis by laboratory investigations, as serological tests are not entirely reliable and microbiological cultures are mostly negative or misinterpreted as colonisation or contamination. A large number of cases are only diagnosed at autopsy. Risk factors for fungal sepsis in the neonatal population include very low birth weight, prematurity (<30 weeks), prolonged hospitalisation, mechanical ventilation, endotracheal intubation, use of central venous lines, use of broad-spectrum antibiotics, total parenteral nutrition and previous colonisation with Candida spp. The clinical signs and symptoms are often nonspecific and not easily distinguishable from bacterial sepsis. Onset is insidious, and the mean age of infection is 33 days. Symptoms may include temperature instability, carbohydrate intolerance, hypotension, apnoea, bradycardia and abdominal distension. The spectrum of symptoms may be intermittent and sometimes absent. A septic very-low-birth-weight (VLBW) infant who deteriorates despite antibiotic treatment should be considered to have a fungal infection. Infants who are first diagnosed at autopsy are often of younger age, have fewer predisposing factors and have deteriorated rapidly. Candida spp. colonise up to 60% of VLBW neonates (those weighing <1 500 g) during their first month in the neonatal intensive care unit. Such colonisation may progress to invasive fungal infection in up to 20% of these patients. Systemic neonatal Candida infection has a predilection for certain organs, including skin, eyes, central nervous system and gastrointestinal tract, and is often disseminated at the time of diagnosis (as was also the case in our patient). Candida was found to be an important pathogen in NEC in at least two recent studies. [4,8] The incidence varied from 7.5% in the USA to 23% in South Africa. The presence of intravascular colonisation of the gastrointestinal tract suggests that candidiasis not only complicates but may in fact cause NEC. Intraluminal fungi damage the endothelial lining with secondary necrosis and an absence of an inflammatory response. A knowledge of the risk factors, including an association with NEC, awareness of the nonspecific signs and symptoms, as well as negative cultures in these patients should assists clinicians and pathologists in the timely diagnosis of fungal infections in neonates. In a review of neonatal blood stream infections in the CMJAH neonatal unit between 2002 and 2003, C. albicans was isolated in 80% of cases. Non-albicans spp. were isolated in 20% of cases. When the incidence was calculated for the period 2007 - 2011 at the same institution, a significant increase in non-albicans isolates (specifically C. parapsilosis) was found. A single case of C. dubliniensis was seen. C. dubliniensis was first isolated from the oral cavities of both HIV-positive and HIV-negative individuals in 1995. Subsequent epidemiological studies have revealed that this species is prevalent globally, is seen in human and non-human habitats, is present in other body sites and has been diagnosed in both HIV-positive and -negative patients. C. dubliniensis has the potential to cause invasive disease, specifically in immunocompromised patients, and may originate from the host's own flora. There have been several small case series reports of paediatric C. dubliniensis infections, particularly in immunocompromised hosts. These patients are often undergoing chemotherapy for underlying malignancy or are infected with HIV. [11,12] The data on neonatal C. dubliniensis are limited and comprises mainly case reports. [13,14] It is likely that HIV-infected patients are not the only hosts susceptible to these infections, as there is an increasing number of reports of various other infected patient populations. Kim et al. state that given the lack of clinical significance and reliability of simpler laboratory tests, the additional time and effort required to distinguish all C. albicans isolates from C. dubliniensis may not be warranted. Larger epidemiological studies are needed to understand better the pathogenic nature of C. dubliniensis in neonatal patients. Acknowledgements. Thanks to Profs H Wainwright and R O C Kaschula for their valued comments on the case, and Prof. Delport for requesting the postmortem examination on this patient.